It started with an email exchange among the contributors to Anchor Rising. Somebody suggested that moderates are essentially liberals who "believe in economics." That got my mind (when hungering for procrastination) to filling out the rest of a political spectrum, and it turned into the circle illustrated below. As you can see, there are eight categories, six of them along the spectrum and two cutting across it. The spectrum circle is divide into Left and Right hemispheres, and the categories are divided into thirds by two vertical axes. 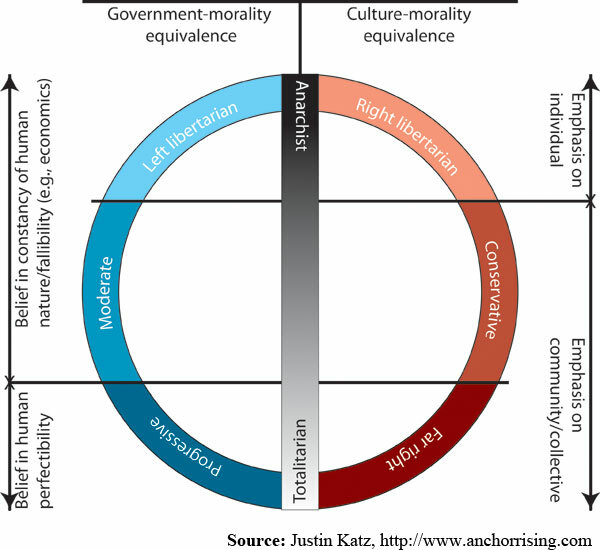 The basic determinant of Left or Right is whether one tends toward equivalence of morality with government or with culture. The important thing isn't whether one believes that, for example, whatever the government dictates should be considered moral. Left libertarians would rail against such a conclusion. Rather, it's about the way in which people in different groups think about these things. A left libertarian thinks government ought to stay out of his life, but he thinks everybody ought to stay out of his life. Generally speaking, he would prefer that whatever impositions do exist should be written into the law, where there are codified rules for fighting it. Or perhaps he just thinks that government mandates are inherently moral impositions and, therefore, should be avoided. Not long ago, I heard a libertarian speak as if the Golden Rule is the source of all evil in our society, but the rules that he favored (property rights, notably), he thought to be justification for the government's use of power to enforce. The Left-Right question, in essence, is: To whatever degree authority of people over each other is legitimate, should the guidelines be written into the law, or should they be expressed through the interpersonal forces of voluntary social interactions? Very few people will have pure answers to that question, but one or the other option will ultimately prove to dominate; the culture may apply some pressure through the law, but it ultimately understands the authority to derive from the beliefs of the people who make up the society, not the conclusions of the people who control the government. One of the two axes that define vertical placement is essentially a belief about human nature. Progressives and those on the far right tend to see humankind as able to be made perfect, whether that's through social engineering (on the Left) or purging and racial purity (on the Right). The apotheosis of this belief is the totalitarian, wherein the dictators or ruling classes find themselves to be so infallible that they ought to be permitted to control every aspect of everybody's lives. As the spectrum approaches this point, the distinction between government and culture breaks down, because the government is all. The X marks on the vertical axes are meant to indicate that the spectrum continues on, but that there is some line that can be crossed after which the person will pick one side over the other. In the case of the left-hand line, the upper segment is a belief in the constancy of human nature and fallibility. This doesn't mean humanity cannot be improved or changed, but that it's not possible to perfect it, and that any social system must take that reality into account. Ultimately, this is an underlying assumption of economics, which premises its studies of the causes and effects of human behavior on the principle that the results will be relatively consistent. The other vertical axis concerns one's emphasizing the individual over the community, or vice versa. Again, the spectrum is ultimately unbroken, but there is a line that can be crossed from libertarian to moderate, on the left, and to conservative, on the right. For instance, I would consider myself to be pretty much on the line that separates right libertarian from conservative, and it would be a matter of some difficulty for me to choose between the individual and the community in a final analysis. (I strike that balance through theology, more on which in a moment.) But I absolutely don't think communal goods should be wrested from the individual without consent, nor that individualism oughtn't be argued against when it threatens the society. I've already heard the complicating consideration that some extreme libertarians and anarchists believe that here is a rational order to the society that they would prescribe, but it isn't pushed through either government or culture. Some in this range (I'll confess) seem mainly to take for granted the structures that have brought themselves advantage, but more intriguing in my context here is that moving away from the most complete joining of the notion of human fallibility with the notion of the primacy of the individual creates a straight, back-door line to totalitarianism in one of two ways: either the strongest person or group dominates the lawless field and controls by physical, political, or economic power, or the faith in the need to impose order on anarchic principles begets a rigid collection of rules for organized action. Either way represents a deterioration and reversal of beliefs across the circle: The emphasis on the individual becomes belief in the individual's perfectibility; the belief in human fallibility becomes a belief in the need for the community to set set the guidelines through culture or through law. That is to say that the Anarchist-Totalitarian axis is not at all stable as a matter of political theory or of personality. My final word is on religion. I'd initially planned to superimpose a shape labeled "belief in God," or something like that, but decided that it would necessarily be too complicated. What one believes about God makes all the difference. A progressive may take the existence of God as evidence that human beings were made to be perfected, and that their moral laws should be written into the civic law. A right libertarian might believe that God's interaction with the individual is so personal and specific that any coercion risks interfering with that divine relationship. In other words, a series of axes describing religious beliefs could probably be made to fit as another layer on this chart, but the principles behind it would be wholly distinct from questions of politics. Perhaps I'll take that up next time I'm procrastinating on a three-day weekend. It is generally accepted that the “Moderate” party is–with the singular curious exception of urban planning–to the right of the RI Republicans. But party names often don’t reflect the party’s beliefs. For instance, the Liberal Party of Australia is conservative, and so is the Liberal Democratic Party of Japan. And the Socialist party of France is not very socialist. Many members of Yisrael Beteinu (Israel is Our Home) actually live in the West Bank. Unless Mr. Block seriously pretends that he is not a conservative, there is no harm done. Actually, the original conversation began with my objection to the suggestion that it is evidence of Block's "moderateness" that conservatives say he's a liberal and liberals say he's a conservative. It's seemed to me, though, that the local leftists are passing judgment on a very narrow band of political positions, mainly having to do with unions and the aforementioned belief in economics. But I had recently had reason to go back through some older content, including some excellent interviews Andrew posted with Block, and it was very clear that his concept of government is well on the liberal side. As for social issues, that isn't even a question. He's very liberal, there. I assume some on the RI left are consciously trying to marginalize Block by pretending he's some sort of right win infiltrator. Effectiveness and efficiency are words only used by "Right Wing Radicals" if we were to believe the governmental unionists. Mr. Block is doomed to being labeled by everyone as being against whichever group is doing the complaining. I suspect he is fairly liberal, but sincerely wants to have government operate as effectively as possible. Why this insistence to categorize folks in only two ways: Liberal or Conservative? The vast majority of regular folks are in the middle, as am I. On any given issue, can a position that anyone in the middle takes be considered a liberal or conservative one? Sure. But does a stance taken on one issue thereby define that individual for all other issues out there to be debated? Of course not. Those on the far right are destined to believe that folks like me are on the far left - because folks like me don't take ideologically-based stances - and the same goes for folks on the far left, who by and large believe that folks like me are on the far right. If you were to stack up the issues and keep score, I suspect that a) you don't have enough to do with your time and b) that the stacks for me would be fairly equally split between the two sides. If you looked at the two sides in terms of ideologically-driven arguments, you would find in most (but not all) cases that I come out on the side that does not derive from ideology. Is it a better way to look at the political dynamic to classify folks as ideologues and non-ideologues? I ask because frankly the political intransigence that we see in DC comes from the margins of the political spectrum, a position that the majority of voters do not occupy. Intellectual history, from the Bible to biology, suggests that it's very useful toward understanding things to put names to them. Categorization isn't an imposition of false descriptions; it's an opportunity to hone understanding down to finer and finer detail. Especially in politics, where we eschew labels, we invite those seeking power to make arguments of convenience not rooted in any of the long experience and intellectual work of our civilization. To your particular point, I'm not sure what you're talking about. The post to which you're commenting offers much more than a binary choice of options. From what I've read of your positions and stated political philosophy, I'm not sure what list of issues would give you even stacks, as you put it. With regard to ideology, I'm not sure what you mean. "Ideological" is another word thrown by people who want to present their own views as somehow purer and more relevant than others'. I'm ideological to the extent that I've constructed an ideological model from my principles, observations, and rational consideration, and that model gives me a framework within which to consider policies. You seem to use "ideological" to imply a sort of handbook of things a person must believe and positions he must take. If you mean the first version of "ideology" as the thing that you do not have, I wonder how coherent your political philosophy could possibly be. If you mean the second, I wonder why you hold yourself so much higher than folks like me. As for "intransigence" in DC, I see that more as the conflict of sincerely held differences of opinion and belief, mixed with a cynical statism that wishes to impose changes that the people won't accept if the choice is made clear. That you fault the "intransigence" suggests to me that you believe there are clear answers that politicians will realize are exactly right if they'll just get over their ideologies. That is, you're judging the scene from a pretty ideological vantage point. The RIFuture crowd labels everyone who isn't a left-wing extremist as "conservative," usually based on some isolated position like gay marriage. So when gay marriage is passed this year, they'll just find some new token issue with which to smear the 80-90% Democratic state government, or that failing, go back to blaming everything and the kitchen sink on Carcieri. You see this with any of the failed totalitarian states around the work: their chronic economic problems are always due to traitors, dissidents, foreign powers, etc. Admitting that Rhode Island is a liberal state would force them to take a hard look at what their progressive economic policies have wrought. Nothing less should be expected - the site is run by Bob Plain, an unabashed liar who publishes falsehoods about people and engages in egregious political censorship. I think the intransigence come from leaders not fully realizing what the impact of their decisions are, either on people they don't regularly interact with or on future generations. Decision makers, especially decision makers in large systems, need some way to fill in the gaps about the consequences that they can't, won't or don't have to immediately experience. In other words, you can't assess the 10-year impacts of all the options in issue area X, by launching every possible pilot program, living through 10 years of each one of them, and seeing how they turn out. Instead, we all in some form or another have to map our knowledge and experience from other areas to the decision at hand. How different people do this is, in large part, what gets called "ideology", and there's no getting around it for anyone. I am reminded of "Government" class, "The far right, and the far left, meet at the extremes". Meaning they both desire a totalitarian form of government. Interesting. I like the visual aid, Justin. While it's not infallible, I like to have my friends take the test at 'politicalcompass.org'. I score in their left-libertarian zone, but close-enough to the middle where I'd probably be on the cusp of 'moderate' on yours. On your party's website under the environment category,it says that building lots should be limited to a quarter acre or less. What size is your home's lot and what sizes are the other members of the Moderate party's lots? Doesn't one of them own a big farm? And how large is your lot? I'm sure however big it must be wasteful,just like your party wants to say other future lots bigger than a quarter acre are wasteful. Also under the environment on your party's website is a statement against developing land in the West of our state. The true center of our governmental system is The U.S. Constitution.